Matt Sorum is the consummate rock journeyman, having played with the Cult, Guns N Roses (which chalked-up $30 million in record sales and two Grammy and MTV award nominations). 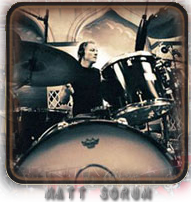 These days Matt provides the slammin beat behind the hard rock supergroup "Velvet Revolver." Great rock drums from a proven hit machine.